With a crisper fat with poblano peppers thanks to the weekly farmshare, I picked out Martha Stewart’s Stuffed Poblano’s recipe for dinner. On first view, the recipe seemed like kind of a pain with all the chopping and the blending and the stuffing, but it ended up being super easy. And here it is all finished. I ended up using mostly shredded mozz. cheese because that’s what we had in the darn fridge. 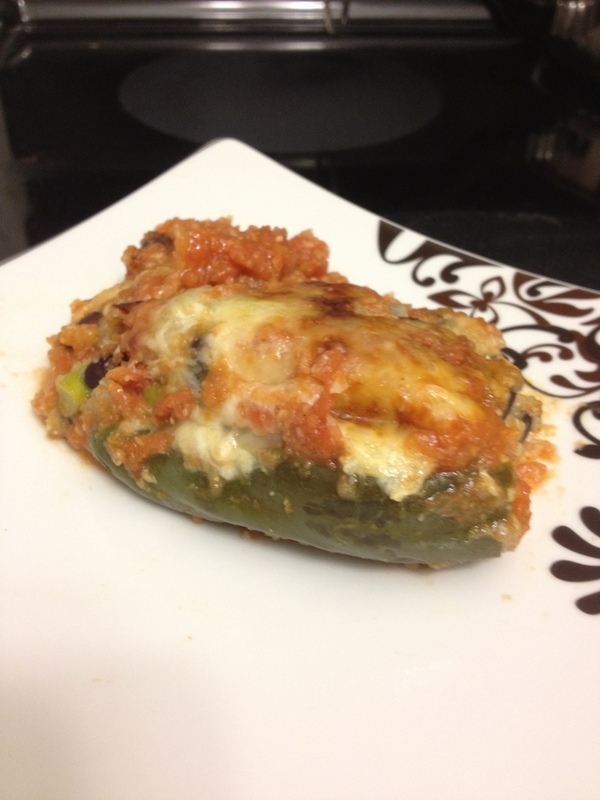 It made very little difference, because the flavor of this dish is in the peppers and other vegetables, and the cornmeal gave it a nice tamale-like texture. I have used poblano peppers in cooking before, but have never had a good sense of how spicy they are, because they’re always mixed in with lots of other things (like in chili). In this dish, I learned that they’ve got a little zing, but are mild enough that even spicy food crybabies like me can enjoy them. 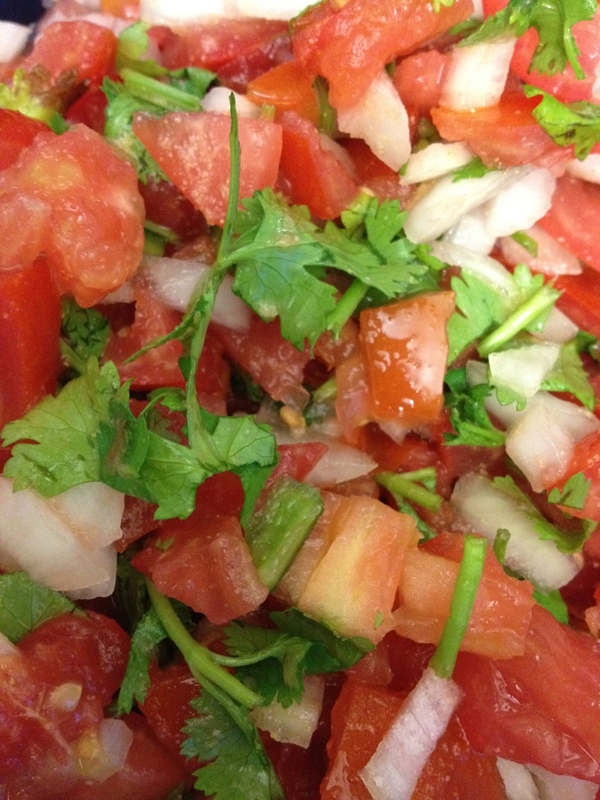 Summer also means eleventythousand tomatoes, and the best thing to do with eleventythousand tomatoes is make pico de gallo. I once made it using a food processor, but Mr. Beez whined because he likes salsa to be extra chunky. I’ve made it by hand ever since. 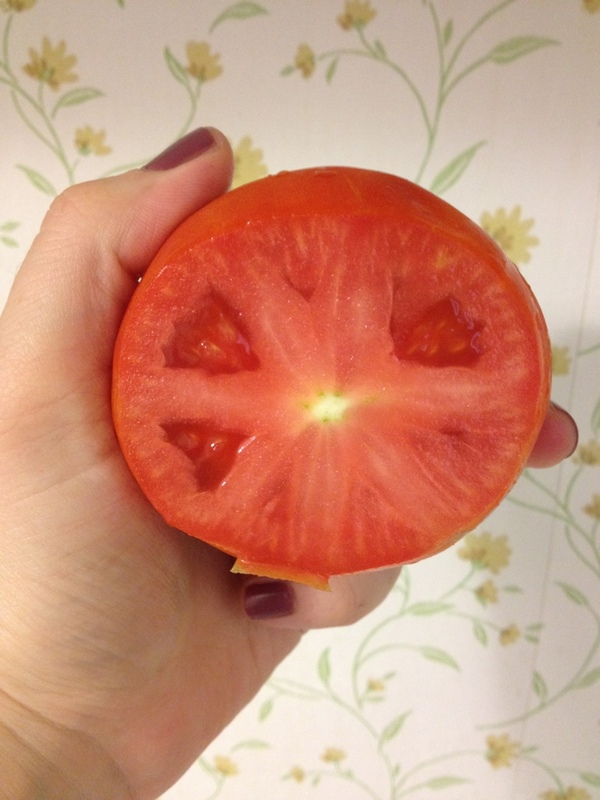 For the longest time the only way I knew how to seed tomatoes was to slice them open and cut out the seed sections. THAT TOOK SO LONG AND WAS SO MISERABLE. I hated de-seeding the stupid things so much that I tried to skip that step entirely, but then the pico de gallo wound up watery. Then I discovered this MAGIC technique, which I will share with YOU today. (I admit, this technique is probably universal knowledge, but sometimes I am slow and stupid, so humor me here). 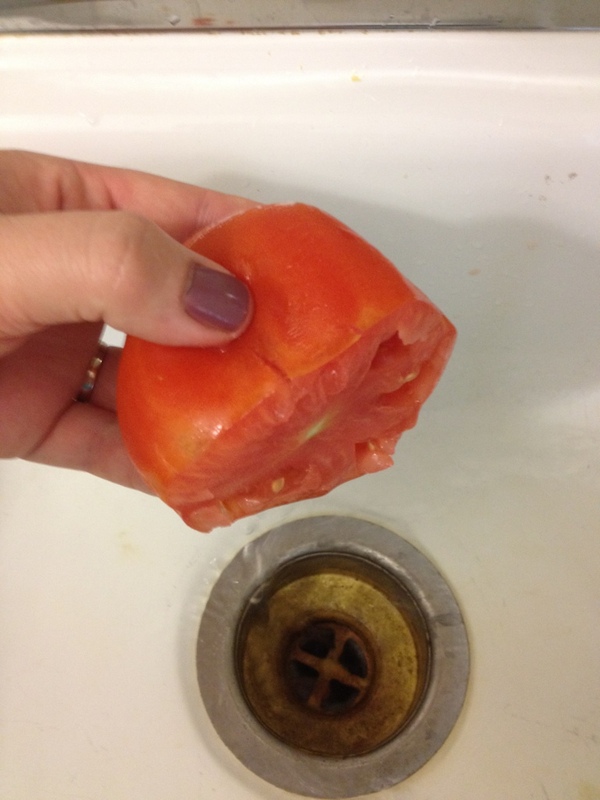 First, you slice the top off the tomato. See all those little sections with the seeds inside? Remember how you used to cut up all those sections and then cut the seeds out of each and every one? Well that was stupid. 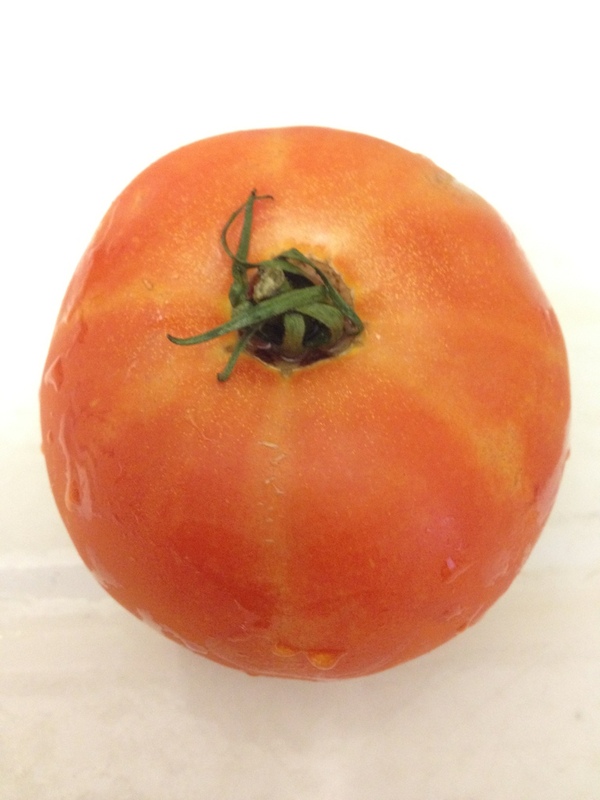 Because all you have to do is squeeze the sections from the bottom of the tomato, up toward the top, and SQUISH, out come the seeds! Add a little onion, cilantro, lime juice, salt and garlic (I prefer garlic powder) and ta da! Pico de gallo! 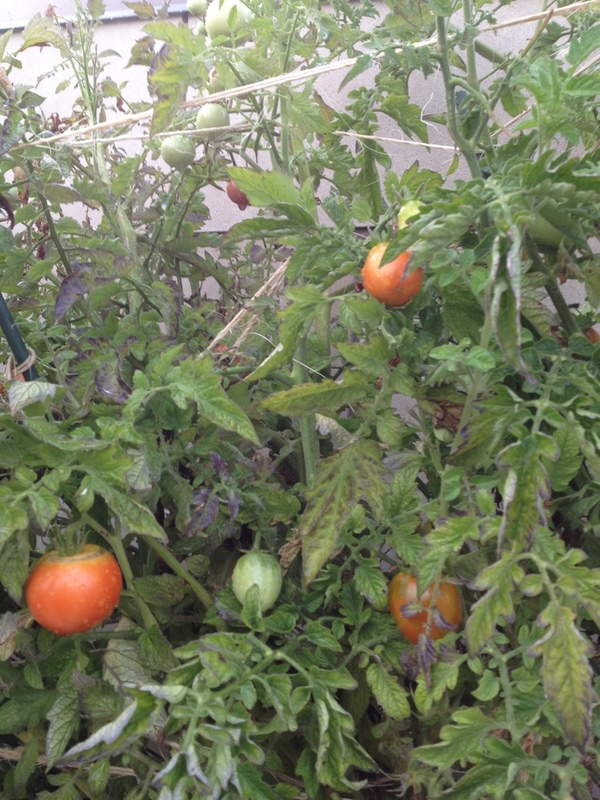 And that is the magic of making de-seeding tomatoes not totally awful! 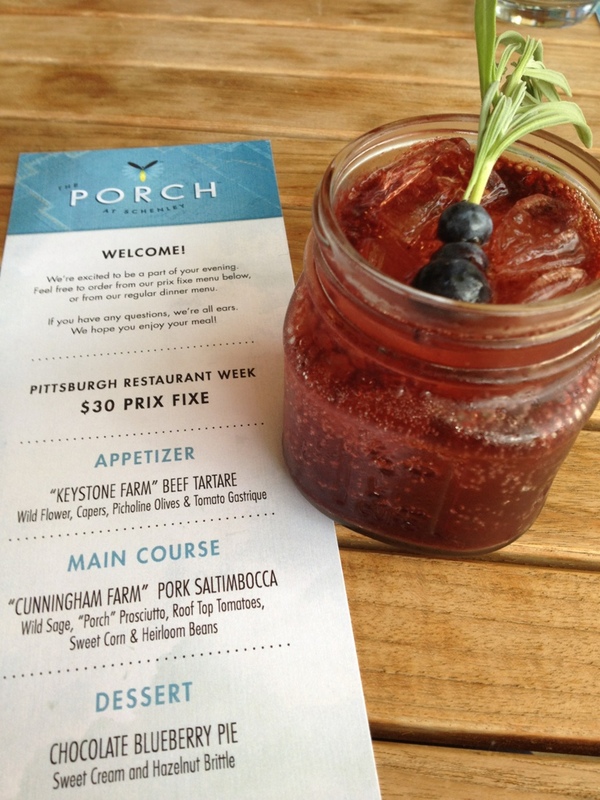 Pittsburgh Restaurant Week featured a food blogger dinner tonight, hosted by the Porch at Schenley Park. 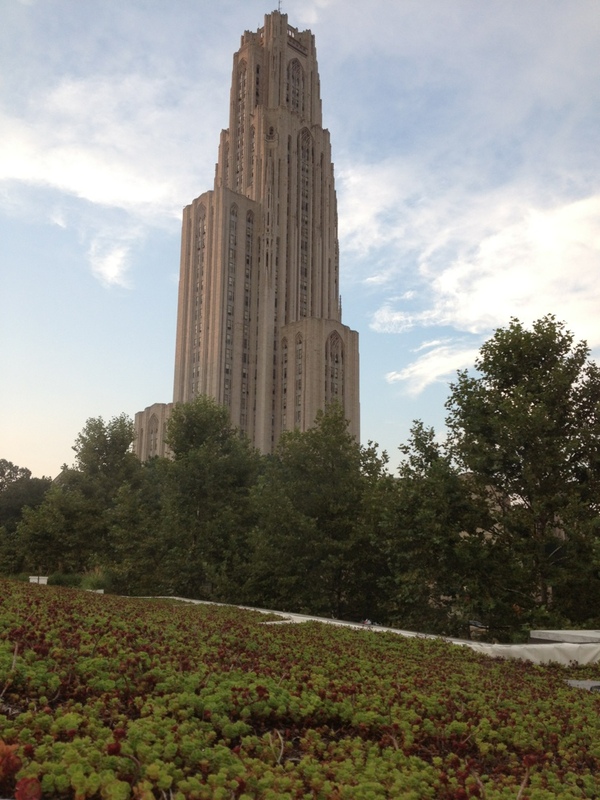 The Porch is a bistro-type eatery in Schenley Plaza that focuses on local fare. 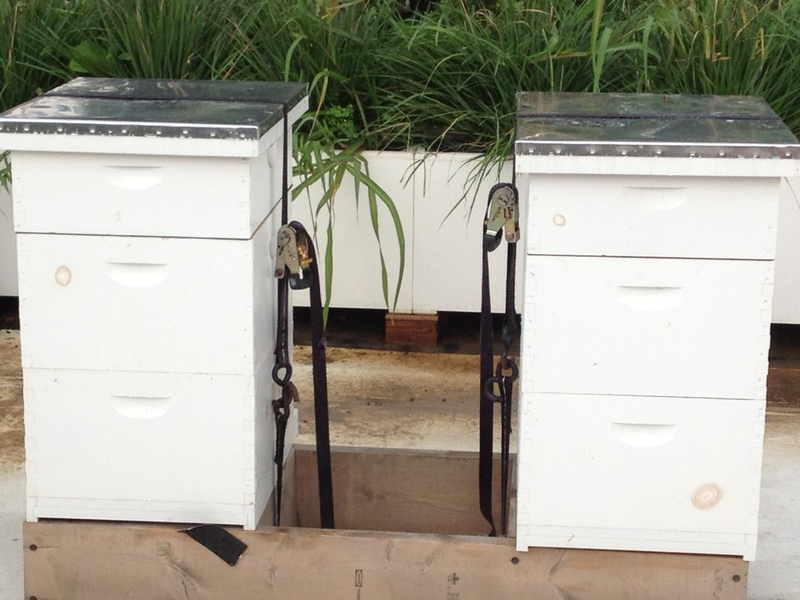 I only learned days ago that it has its own rooftop garden and beehive. Our price fixe meal special also included the opportunity to hike up to the roof and check out the garden! We started the evening with refreshing blueberry lavender cocktails, featuring Wigle Whiskey. I’m not a huge blueberry fan, but these were great. 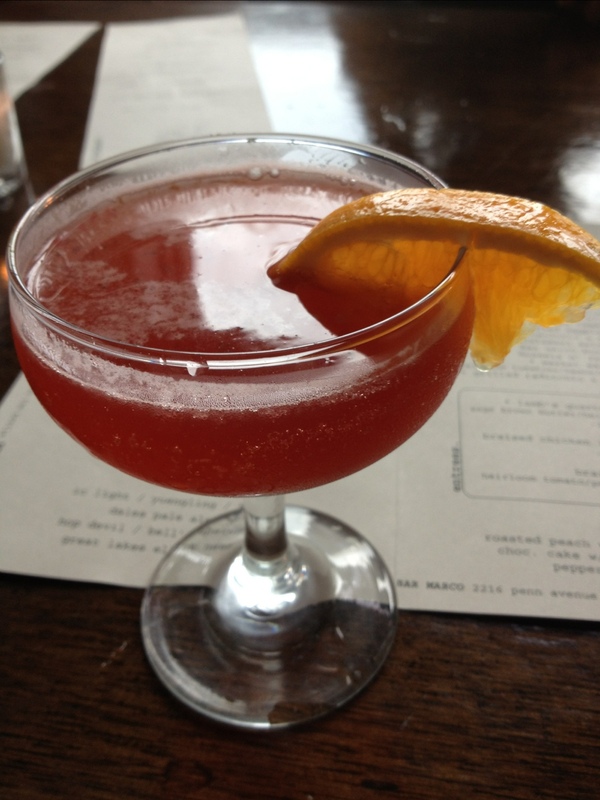 I could spend hours sipping them at the Porch’s outdoor tables, as the sun slowly sinks. 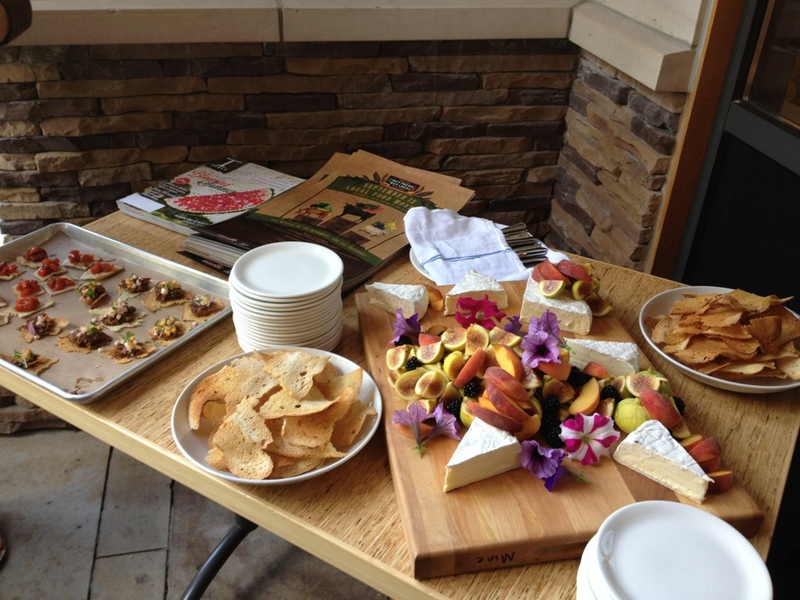 The Porch offered a generous spread of fruit, cheese, and small eats (even oysters! but I didn’t snap a pictures of those). 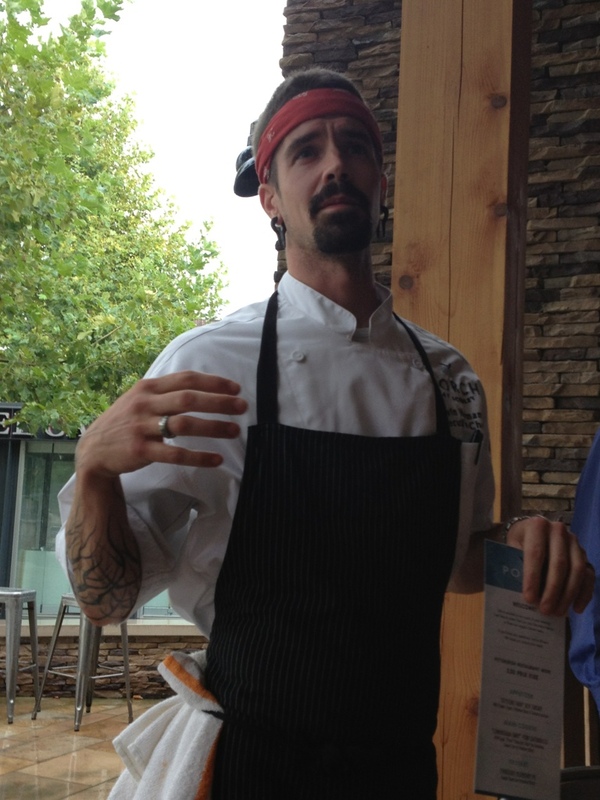 The Porch’s executive chef came out and chatted with us about his philosophy, and his guiding principles in running the restaurant. He tends the rooftop gardens himself, and he also has a half-cow sent in monthly, which they butcher in house. In addition to butchering, creating menus, tending to customers, and cooking, the chef is also personally responsible for the rooftop garden. When does this guy sleep? My friend Katy and I were lucky to share our table with Quelcy of With the Grains, and Ali (whose blog name I can’t remember! Ali, if you see this, tell me your blog name!!) We had great conversation and great food! 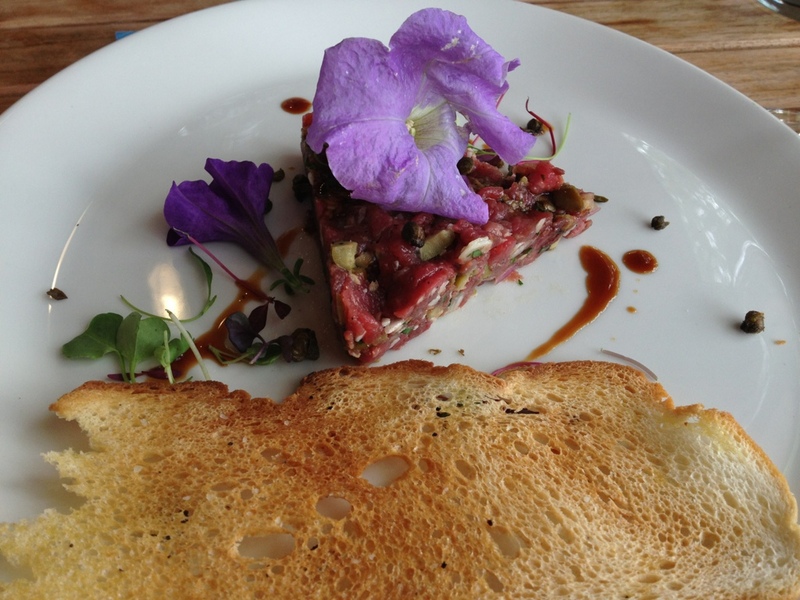 The starter was a beef tartare dish that was ENORMOUS. I’ve only ever been served beef tartare in bite-sized portions. This was a lot of tartare. 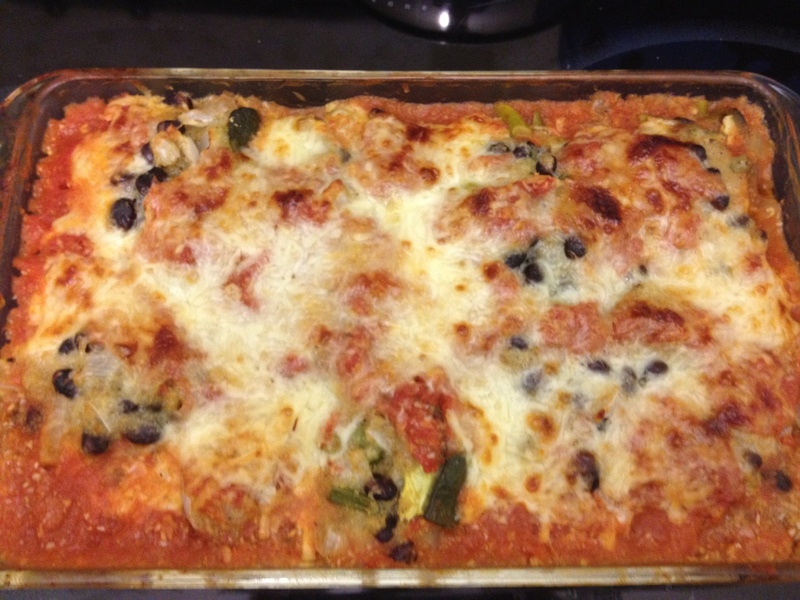 I liked the mix of olive and herbs with the meat, it gave it a nice salty, flavorful taste. 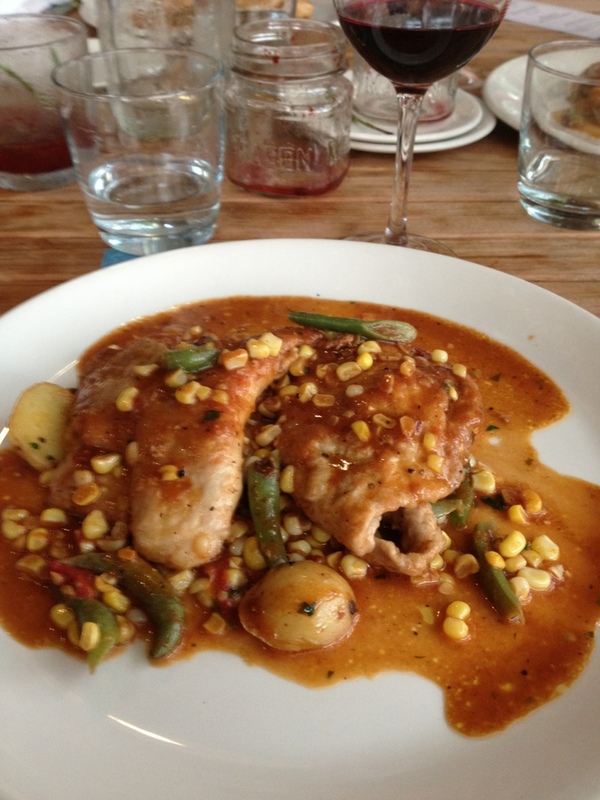 The main dish was a pork saltimbocca. I had no idea what saltimbocca was, but it is essentially a cooking technique that involves filling the meat with herbs and (in this case) proscioutto. The flavor was homey and accessible. I especially liked that it incorporated beans and tomatoes from the rooftop garden. 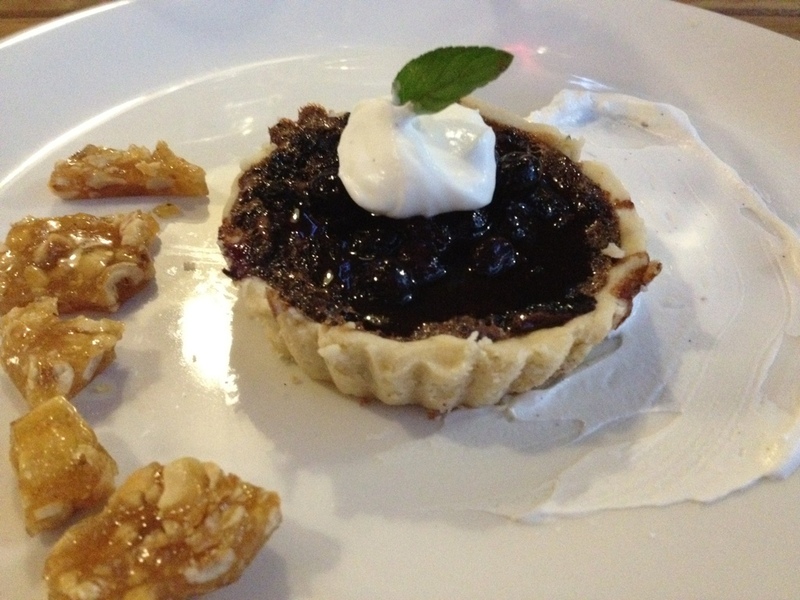 The dessert was a blueberry and chocolate tart accompanied by hazelnut brittle. I don’t much care for blueberry pie, and I considered requesting something else, but the chef did promise that it was AWESOME. He was right. The blueberries did not overtake the dish, and they complemented the chocolate beautifully. That was a darn good tart. I skipped the brittle, because after a childhood incident in which I ate an entire jar of Nutella (don’t do that), I can’t stomach the taste of hazelnuts. My dining companions, though, spoke highly of the brittle. We get a rather substantial weekly farmshare from Penn’s Corner, and since we were out of town the last two weekends, bags of tomatoes, peppers, potatoes and greens have taken over the fridge. I’m on a mad rush to try and use up as much of this stuff as possible, because it breaks my heart when it goes bad. 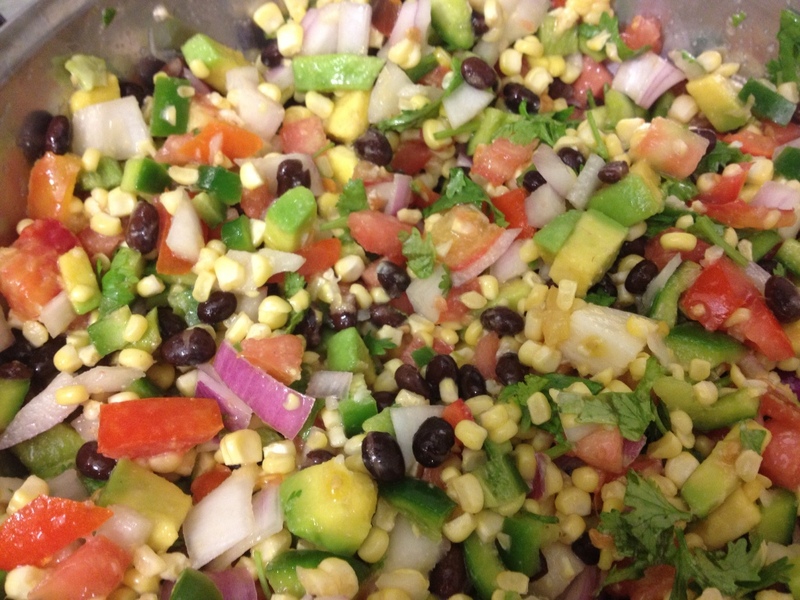 I made a Corn, Black Bean & Avocado salsa. That is a whole LOT of salsa. But do you know how long fresh salsa lasts in this house? I’ll give you a hint. Not long. 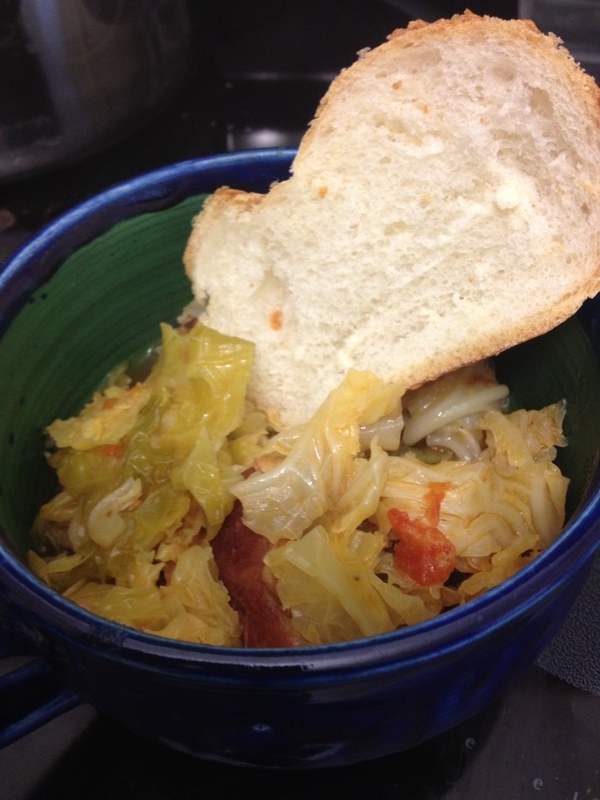 And although this totally does not coordinate with salsa, I made an Irish Bacon & Cabbage Soup. 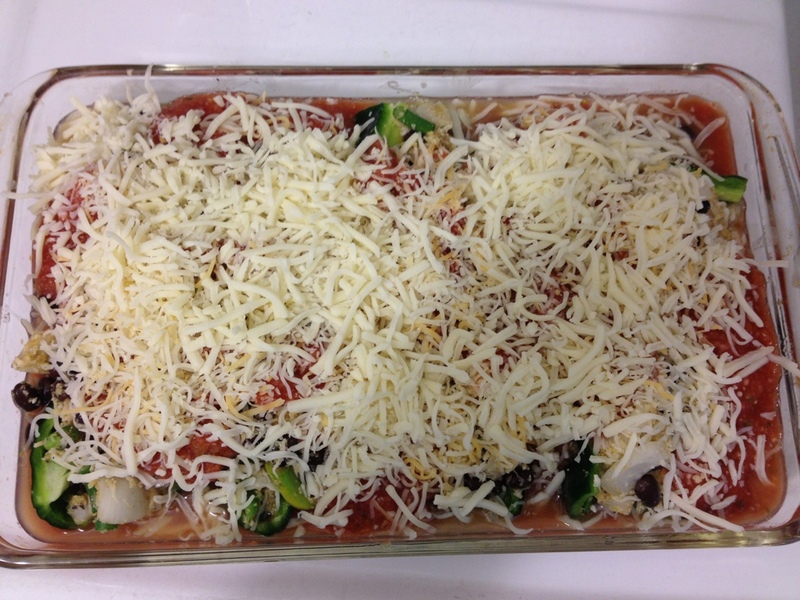 It was ridiculously easy, and ridiculously filling. 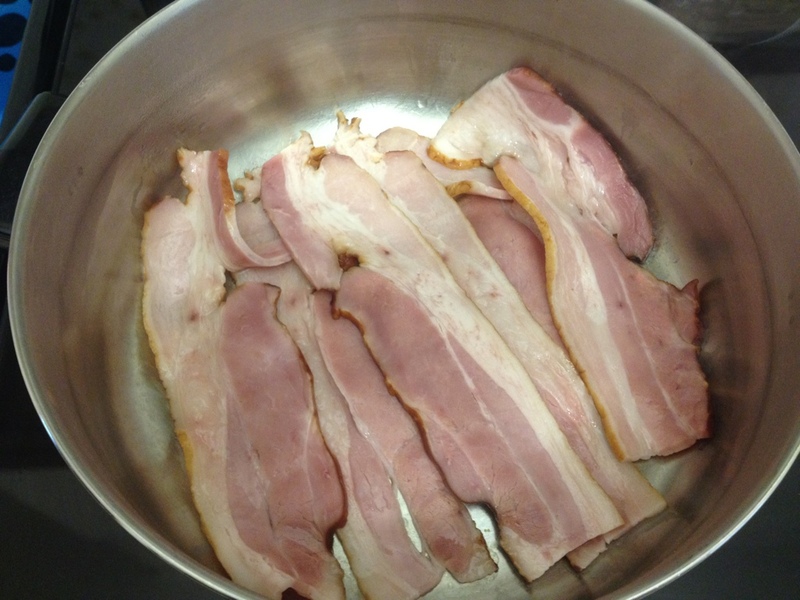 First you cook the bacon, and drain the grease. 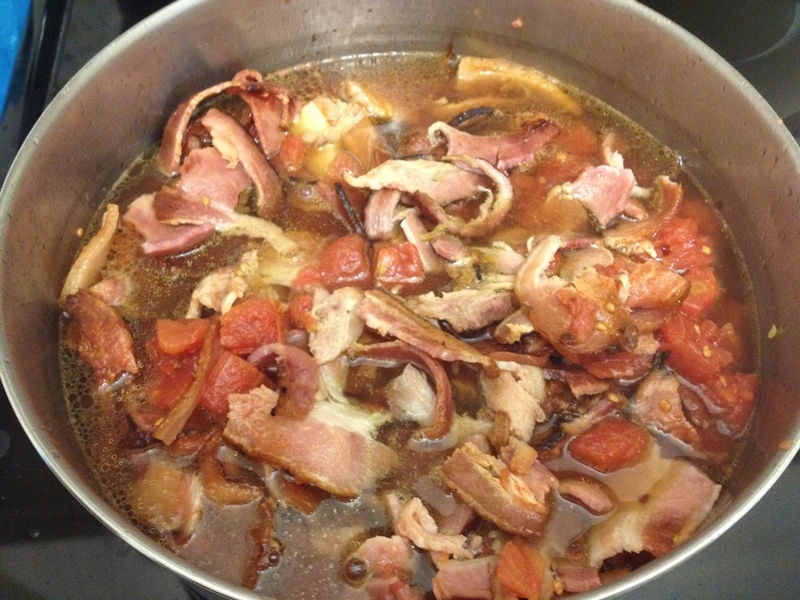 Then you add tomatoes and potatoes and stock. Then you add in the cabbage, and cook til the cabbage is soft. Bar Marco is a new little place (in the Strip District building that formerly housed Embury/Firehouse) that focuses on handcrafted cocktails with homemade mixers, and locally sourced foods. With the Grains has posted lovingly about Bar Marco a few times recently, and was enamored with both its brunch offerings, and its dinner offerings. I was very excited to see that one of my firm’s Summer Associate events was planned for Bar Marco. The food and the cocktails did not disappoint. What I liked most about Bar Marco is that its servers are knowledgeable. I wasn’t familiar with most of the cocktails on the menu, and I took the classy approach of pointing to the menu and asking “WHAT’S THAT?” The server had a keen handle on the drink as a whole, as well as its constituent parts, including detailed descriptions of what the various mixers are and how they are made, and how the drink itself is assembled. This was the [Something I don’t remember] Rickey. The website menu shows a “Joe Rickey” but I’m fairly sure it was not that. The drink was high quality but not quite to my taste. The downfall of writing a post like 2 weeks after you visited a place is that you remember your general impressions, but not the specifics underlying those impressions. So I can tell you this drink was not 100% my thing (maybe like 70% my thing) but I don’t remember why. The Charcuterie plate is generous and delicious. 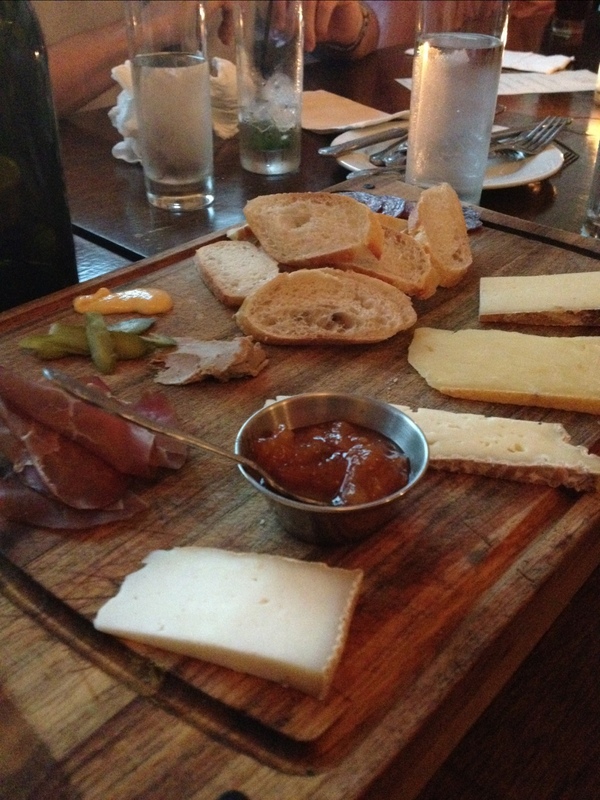 The meats and cheeses were such high quality, and a range in flavor/texture. I could eat meats and cheeses all day. 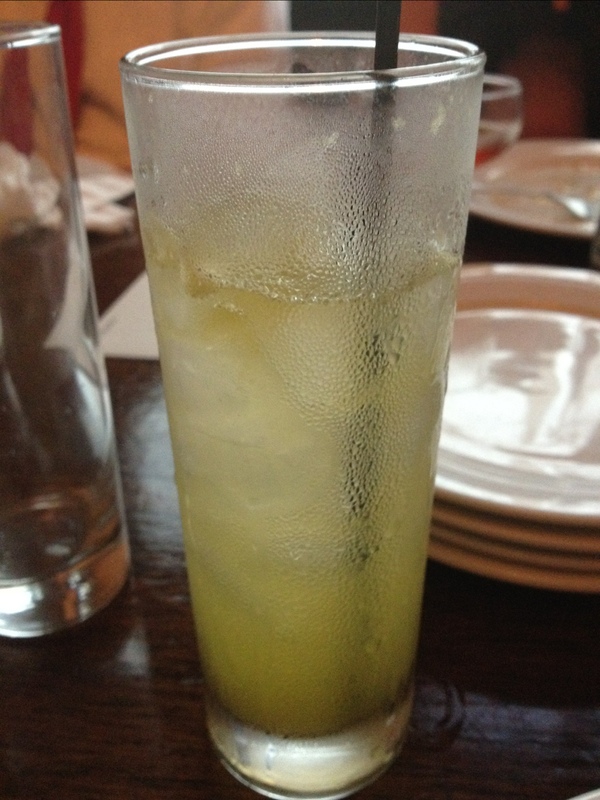 THIS drink, the ‘treuse, was perfectly to my taste! It’s a little citrusy and a lot delicious. It’s the kind of drink that I liked so much that, on my next visit, I would be sorely tempted to only drink the ‘treuse, and not bother exploring the rest of the drink menu. 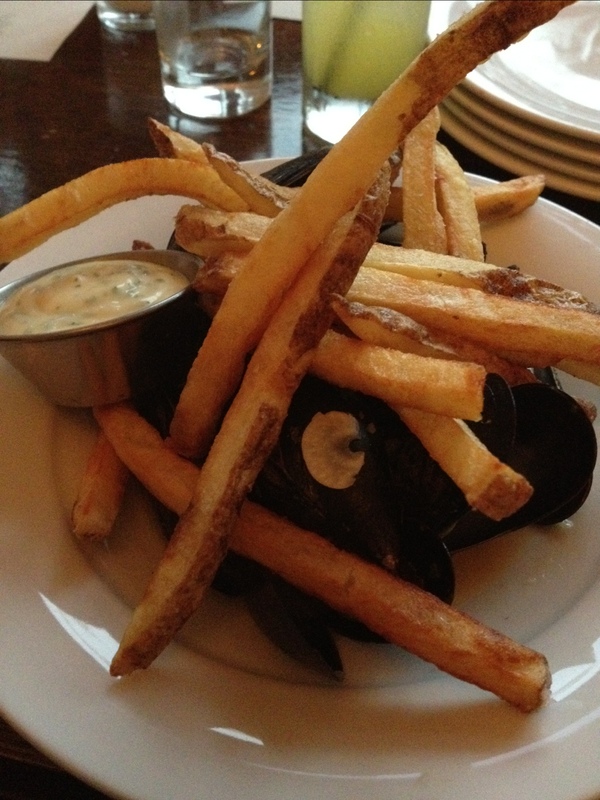 I had the mussels for dinner. The server explained that one of the seasonings fennel, except I don’t really like fennel, but he said this is the “fennel dish for people who don’t like fennel.” Amazingly, he was right. You don’t taste the fennel independently in the black liquorice sense. The fennel complements and enriches the other flavors. These were great mussels, although I must admit that once my companions’ plates arrived, I was a little sad that I did not order the boar dish. THAT looked AMAZING. Compared to many other watering holes, the cocktail prices here are on the higher side (for the small size of the glass). However, the quality is incomparable, so it is well worth the price. Both the food and cocktail menus seem to rotate frequently, so each visit will be a new experience. I can’t wait to make it back there.